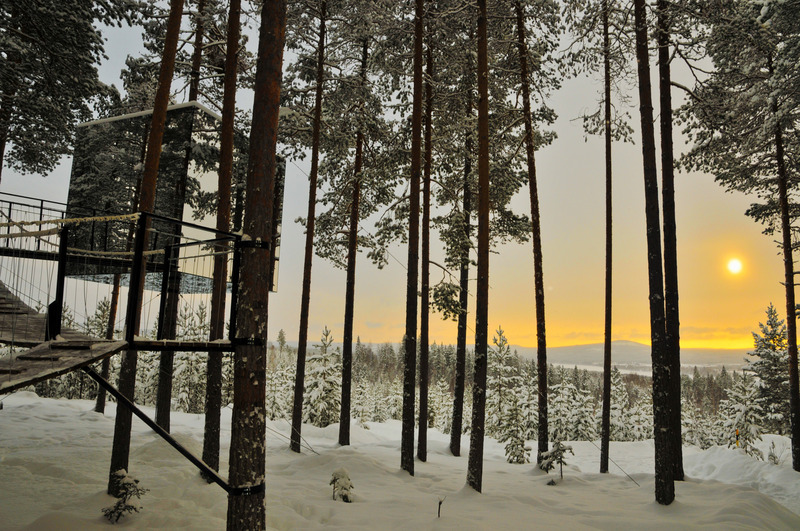 A tree hotel in the far north of Sweden, near the small village of Harads, close to the Arctic Circle. Conrad Taylor makes an Englishman’s attempt to explain Sweden – a complex and loveable country, about which many people abroad have cartoon impressions. Sweden is a big country with a huge rural backwoods, twice as large as Great Britain and yet with a population of only ten million. The countryside sings to me as it might to anyone who grew up in rural Scotland. The northernmost three-fifths of Sweden has a sub-Arctic climate, and 15% of the country is within the Arctic Circle, experiencing the full Midnight Sun. The north today is economically important for its huge iron ore reserves, and a string of hydropower plants. Germanic peoples settled the Scandinavian lands of Norway, Denmark and Sweden a few thousand years ago. In the ‘Viking Age’, adventurers from Sweden traded and established settlements such as Novgorod and Kiev along the Russian rivers, even reaching Constantinople and the Muslim lands. Archaeologists have found huge hoards of Islamic silver coins which attest to their success. During the 14th century, Sweden, Norway and Denmark entered a political union, with Denmark as the dominant power. Sweden regained independence after a struggle, when Gustav Vasa was elected king on 6 June 1523: the anniversary is celebrated as Sweden’s National Day. Gustav Vasa also broke with Papal authority and established Lutheran Protestantism as the state religion. In the 17th century, Sweden annexed eastern Finland, the Baltic States, Scania and parts of northern Germany, and the powerful and rich ‘Swedish Empire’ was born. But in the following century, imperial ambitions were beaten back: 200,000 Swedish troops died in the Great Northern War, and Russia gained dominance over the Baltic. At home, ordinary Swedes benefited from a constitutional monarchy with Parliament (the Riksdag) in charge, and relative peace came. The last time Sweden went to war was 1814. This period, dubbed the ‘Age of Liberty’, also saw the first constitutional guarantee anywhere in the world of press freedom, in the 1766 ‘Law on the Freedom of Printing’. Sweden doubled its population between 1750 and 1850, but remained an agricultural economy, where workers faced low wages and few rights. Poor weather and bad harvests brought famine in the 1860s. More than a million people – a quarter of the population – had emigrated to America by 1910, especially after steamship lines catered especially for the trade. In 1905 there were more Swedes living in Chicago than in Sweden’s second city, Gothenburg! Many of the emigrants bought farming land cheaply in the prairie states of Minnesota, Iowa and Idaho. Enquiries into the causes of emigration led to improved wages, and freedoms for trades unions, non-established churches and social movements. Industrialisation took off in the 1860s, starting with extractive industries based on timber and related products, such as matches and pit-props for coal mines; also iron and steel. Extensive railways were laid, and engineering industries developed, including something of a Swedish export speciality – high quality ball-bearings, made by SKF in Gothenburg from 1907. Sweden today is a diverse industrial and export-oriented economy, with half of production and exports coming from engineering. Other major contributors are telecommunications, pharmaceuticals and the automotive sector (cars and trucks). Many industries are based on knowledge, research and creativity. Sweden has been a member of the European Union since 2003 and its largest trade flows are with Germany, the USA, Norway, the UK, Denmark and Finland. In the post-WWII period, Sweden took a path of relatively high taxation, and high spending on social welfare goals. The proportion of people employed by the State and municipalities is also high. Parenthood is generously supported, and the country is active in international aid, support for political refugees, and peacekeeping through the UN. IKEA* – TetraPak – Ericsson – Volvo* and Saab – Absolut* vodka – Skype – Spotify – Minecraft – ABBA – Bjorn Borg – Zlatan Ibrahimovic – Ingmar Bergman – Ingrid Bergman – Max von Sydow.